Confluence organizes its content in spaces. Questions recognizes that some content should be available anywhere—so questions can be created in the global questions space and organized just by topic, or asked inside a space, to inherit space permissions and keep things together. If you have permissions to use Questions, you'll see Questions in the Confluence sidebar, and questions will appear in your search results. When asking a question, people can choose to ask a question in a space. This might be for permissions reasons (to make the question private and only visible to people who can see that space) or to keep questions and pages for a team or project together. To view and search for questions in a space click Questions in the sidebar. 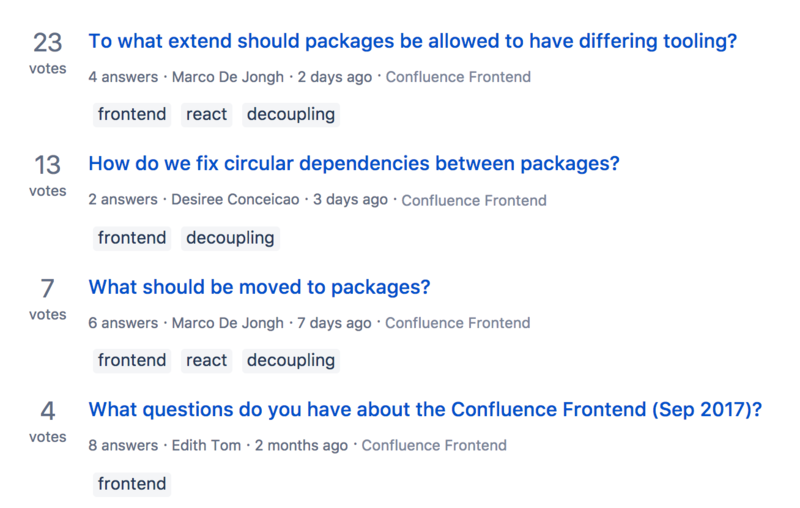 When you install Questions for Confluence, a space for global questions is created. Global questions are questions that aren't asked in a specific Confluence space, but are instead posed to your whole site. You shouldn't delete this space, as deleting it will delete vital Questions info and Questions won't function as it should. One way to encourage users to use questions is to display them on pages using the Questions List macro. 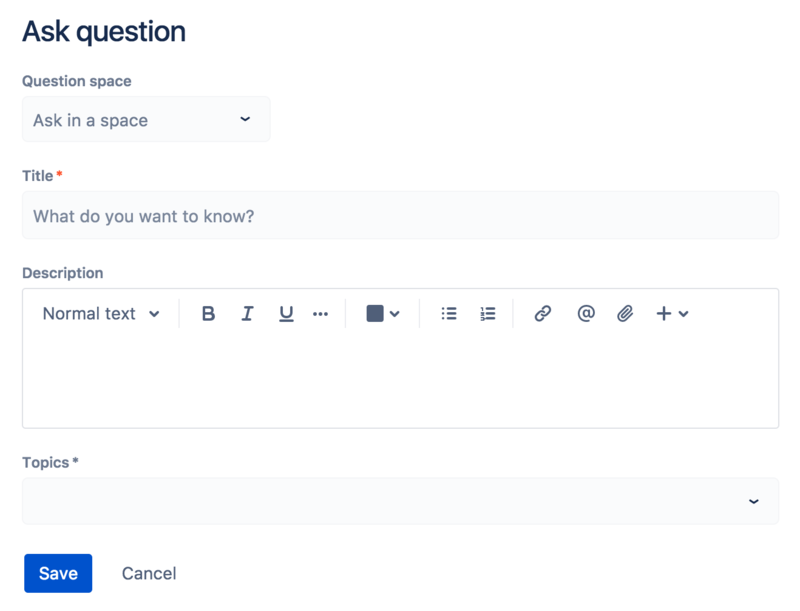 For example, if you use Confluence as your intranet, you might include the 5 most popular questions with the topic "human-resources" on pages for new starters in your team. The macro will show all matching questions (including questions asked in any spaces you have permission to view). Encourage your users to ask their own questions by including a link to the Create question page. Edit a page and choose from the toolbar. This will open up the Insert link dialog. Add in the Link text (for example, you might choose Ask a question), then click Save. Users who click on the text will then get taken to the following screen. The Content by Label macro is great for displaying a list of questions, pages and blogs that have a specific label (or topic) applied. All content, including questions, pages, and blogs that contain the topics specified will appear in the list.